Forest Garden Basil Multiplay Playhouse: This multi-functional playhouse features a closed playhouse section with a window and stable style door, there is also an undercover veranda area with an open front and windows to the side and back to provide plenty of undercover play space with plenty of ventilation and natural light able to get in. This wooden playhouse has a generous 32 square feet of accommodation to provide space for multiple children to enjoy playing in this fun outdoor environment. 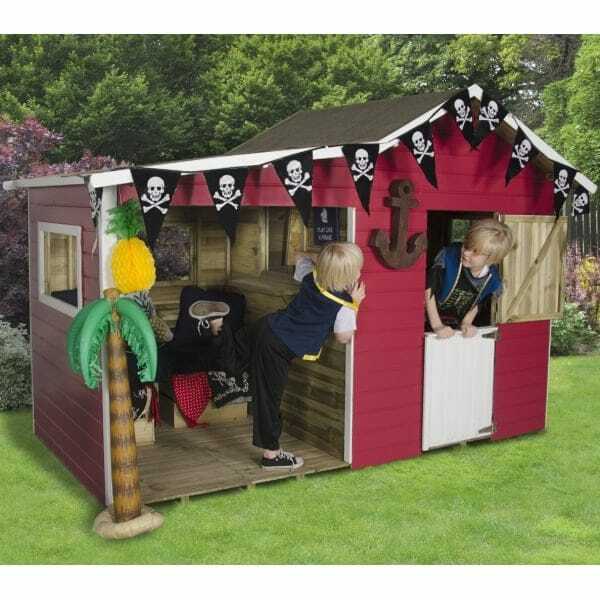 The playhouse is made from quality tongue and groove construction panels which are 12mm thick. There is also a solid timber boarded floor and roof included. The whole building is pressure treated to prevent rot and comes with a 15 year manufacturer’s guarantee. The windows are styrene glazed for added safety when in use by the little ones in the garden.